I’m in the process of selecting a linear actuator and it looks like Misumi has a lot of options to choose from. What do I need to know to choose the best actuator for my application? Thanks for your question. As you know, linear actuators are used in a variety of applications such as medical equipment, test instruments, factory processes and assembly machinery. Since each application will have its own performance and safety requirements, actuator selection can be tricky. Improper selection almost always results in premature failure and expensive maintenance cost when undersized, or high initial cost if oversized. I frequently hear engineers express frustration when attempting to choose the correct linear actuator for their application because there are so many options to choose from. However, regardless of your application, there are some fundamental things you need to know when selecting your actuator: Actuator Orientation, Stoke Length, Force & Velocity, Loads & Moments, Environment, and desired Precision/Accuracy. The actuator orientation will dictate the size and type of motor needed to drive the actuator as well as the load ratings for the actuator motor combination. An actuator in a vertical orientation will have a lower load capability and the use of an electromagnetic brake motor is highly recommended to prevent the load from falling during a power failure event. In a horizontal orientation, the highest load capacity can be achieved and a brake will not be required. When comparing the two orientations using the same load, a vertical actuator will require a larger more powerful motor compared to the same actuator mounted horizontally. When determining your application requirements to select your linear actuator, careful consideration needs to be taken to make your selection based on metric units. Choosing the correct actuator length will depend on whether one or two blocks are used, where an actuator with two blocks will have a longer overall length for the same stroke. Keep in mind the overall length of an actuator is going to be the working distance of travel plus the “dead length” at either end of the actuator typically consisting of the motor, coupler and mounting bracket. If your application involves impact or an abrupt stop, you may need to consider the impact force to appropriately mount and insulate your system. Understanding the force and velocity of your application is critical because it can affect selection of other parts of your linear actuator such as the ball screws, nuts and the motors. The impact force (which is generally twice as much as the average force) will help you determine the inertial forces for cushioning. While the total force (the sum of acceleration force, frictional force and breakaway force) will help you understand the desired motion you’re attempting to generate and help select the right size actuator and motor. The position of the load plays an important factor in choosing the correct actuator. Overhanging or cantilevered loads can create moments or twisting forces on the carriage of the actuator calculated by multiplying the force by the distance offset from the actuator axis. If the allowable moment is exceeded, the linear actuator could suffer damage. Based on the combination of the actuator orientation and the load position, there may be moment loads in as many as three directions. Each direction needs to be evaluated and verified against the allowable moment load of the actuator. The further the load is from the center axis, the larger the resultant moment. Even if you take the time to determine all the above factors, if you fail to consider the part that your environment will play in the performance of your actuator you could be setting yourself up for disastrous results. Before you select your linear actuator, you also need to know if it will be used in extreme heat or cold temperatures, if it will be subject to dirty or wet conditions and if it will be in contact with any corrosive chemicals. These conditions can often times call for the use of cleanroom-rated actuators. Before you select your actuator, you should also know what level of precision and accuracy is necessary for your application. While precision and accuracy may seem like the same thing, they aren’t and will produce different results both individually and combined. Accuracy is the ability to hit within the same distance from the commanded position each time much like hitting the same ring from a bulls-eye. Precision or repeatability is the ability to hit the same spot each time. The actual position may not be the same as the commanded position; however, each consecutive motion will be in approximately the same location relative to the previous position. Combining both accuracy and repeatability is the best possible scenario and is like hitting the bulls-eye every time. 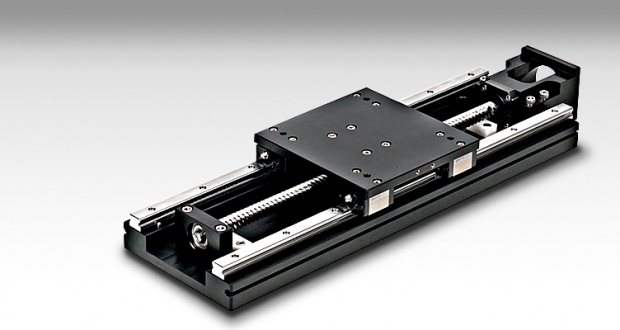 High grade and Precision grade linear actuators provide excellent accuracy and repeatability. Both grades have preloaded bearings on the side carriage and the ball screw. This preload limits the backlash, pitch and roll, and improves the overall precision of the actuators. As I mentioned before, the linear actuator you select will vary depending on your industry and safety requirements. Email me at vyonata@misumisusa.com and I’ll walk you though selecting the Linear Actuator that is best suited for your specific requirements. I am a Product Development Engineer with the Misumi Linear Motion Department. Prior to Misumi I worked in the motion industry as an application engineer helping design custom industrial applications. I was born in Indonesia and moved to the states when I was 15. During my spare time, I enjoy going to the gym to work out or going for a jog with my dog.